Use on an iPad pro in Artstudio Pro or Adobe Sketch! This set grows! 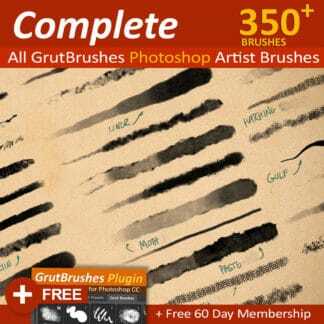 Buy it now and download it forever, no matter how many new brushes are added. Photoshop pattern brushes that flow from the tip of your stylus. The patterns follow the direction of your brush strokes and grow or shrink as you add more or less pressure to your stylus. 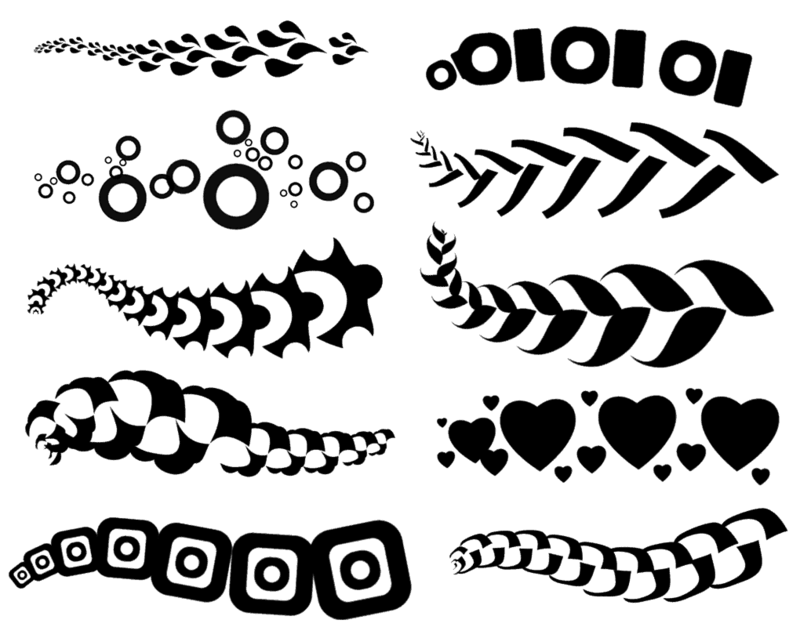 These Photoshop pattern brushes are part of a living set - pay a pittance now for abundance later! 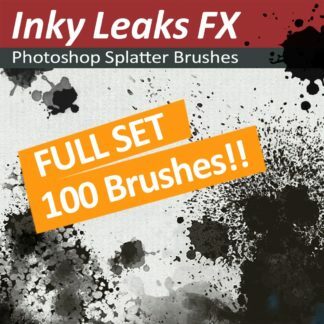 The number of brushes in this set will grow over time (33 right now) but so will the price so lock in now at today's price and get all future updates for free! Buy it today while it's cheap! Photoshop pattern brushes follow the direction of your brush stroke! The Photoshop pattern brushes follow the direction of your brush stroke, the pattern flows from the tip of your stylus and also changes according to your stylus pressure. This will take a little practice to get right (that's what undo is for) Make sure your tablet pressure settings are where you like them too! 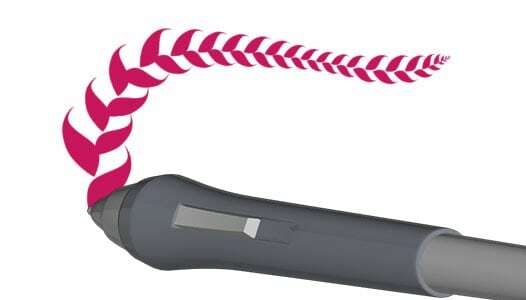 Stroke the Path of a Curved Line With any Pattern Brush! 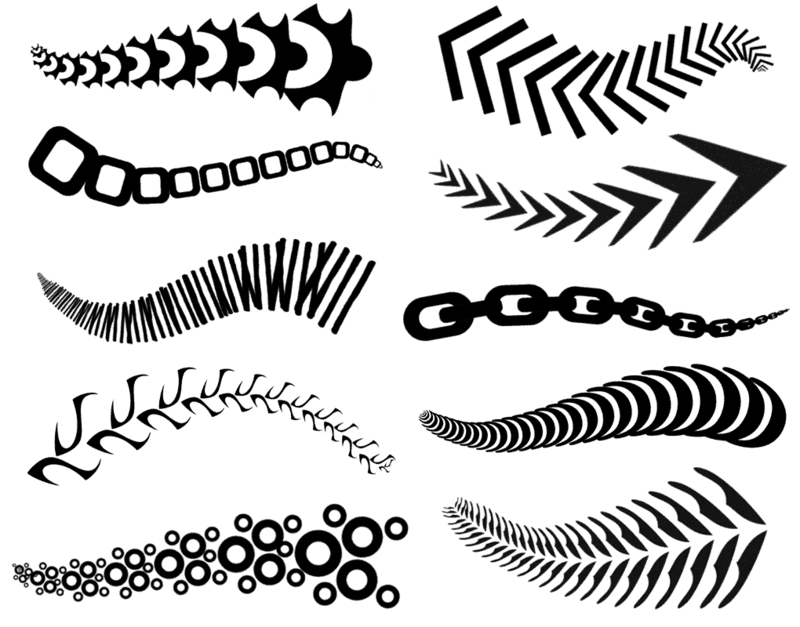 You can use these brushes to stroke a vector path with whatever Photoshop pattern you want and it will follow all the curves of your path. Don't like the line? undo, adjust and redo the path stroke again until it's perfect. Use the 'Fade' option to gradually scale the pattern down over the length of your stroke. If you download a lot of brushes from the internet you may notice a lot of jagged edges when you look closely. I spend a lot of time making sure that the pattern sources (vectors wherever possible) render out nicely antialiased shapes with an edge that remains fairly crisp with the minimum amount of jagged edges possible. Although I aim for a base pattern shape of around 300 pixels per "pattern unit" The sources I use are quite a bit larger. This lets me allow the brushes to overshoot the base size when you push harder on the stylus and still keep your edges crispy. Just don't scale it up too much, I can only cover you so far! I work hard to try to keep these Photoshop pattern brushes as small as possible, usually between between 5kb and 50kb to save your RAM for better things. That helps keep them fast and as responsive as possible too. How can such a small set cost $20? This is a 'living set' that will grow over time. 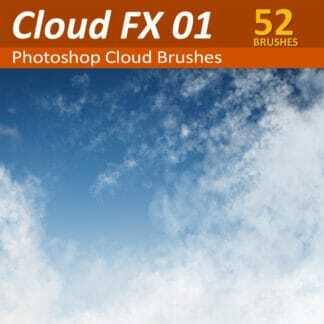 Both the number of brushes and the price will increase periodically. The full price listed above with the slash through it ($20 ) is what I expect the set to cost when I stop updating it. 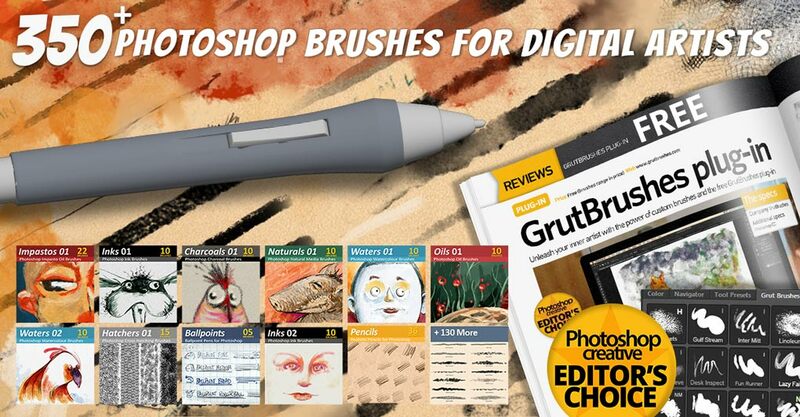 You will get any new pattern brushes I ever put into it, even if you pay the discounted price now. 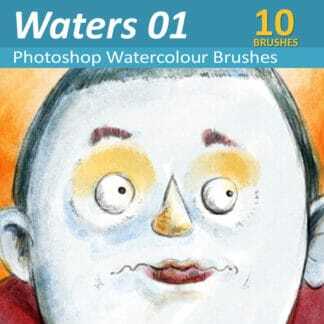 This allows me to fund the development of more brushes and allows you to get the finished product later at a massive discount today. There are no guarantees as to how big the final set will be so if you have any doubt about the value of this deal I strongly advise you to wait until the set is finished, you will always be able to buy it at full price later. How many brushes will be included? Right now there are 11 33 brushes in there but I really don't know how many there will be in the end. 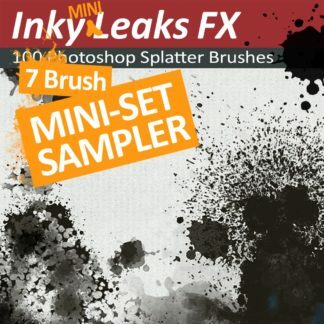 I can tell you that the InkyLeaks FX splatter brush set started at $1 with 10 brushes and ended up at $12 with 100 brushes. I expect this set may end up at $20 with 100 brushes but I could be completely wrong (in either direction) I don't want to promise brushes and make them just to fulfill a quota, I only want to include brushes I think are up to par. Keep in mind that if I get hit by a meteor tomorrow it will stay at this price and size forever. Anything could happen. Don't buy it unless you would be happy paying for it as it is now. When Will there be new brushes? The best answer I can give is: when I have new brushes that I think deserve to be in this set I will add them. I make brushes all the time and sometimes I make a lot that I like in a short time and sometimes I make many terrible ones that never leave the lab. When I spot a good one I'll put it in here so come back anytime and have a look. Should I download both zip files? Can I Use Them on an iPad? YES! I have successfully loaded them into Artstudio Pro and Adobe Sketch on an iPad Pro. Those are the only two apps I think they will work in. Do They Work In Photoshop Elements, Procreate, GIMP, Krita, etc? **Do They Work In Photoshop CS5 And CS6? Sort of, but you will have to modify them a little. Once you select one you may find that they are very faint or they don't show up at all. You will have to open the brush panel and uncheck "Texture" to get them to paint fully opaque. Then I'm afraid you will have to resave them as new Tool Presets or the texture may turn on again every time you select it. What difference does unchecking the Textures box make? That setting makes the edges crisp. Here is a comparison of the edges in Photoshop CC with texture setting on and next to that, the brush with the texture setting "off" in Photoshop CS. 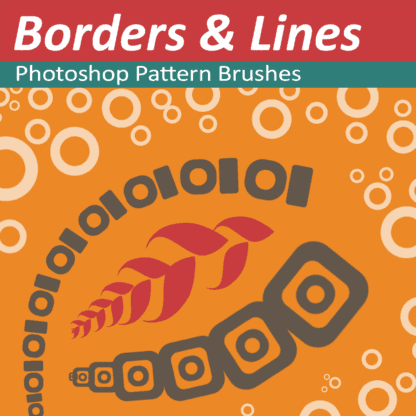 How Do I Install The Pattern Brushes Into Photoshop? 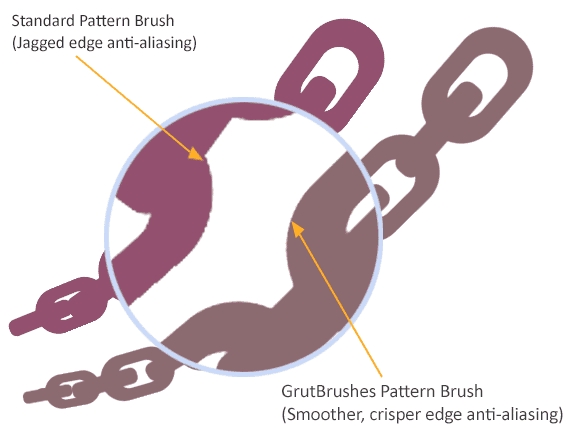 Find the file named "GrutBrushes-Pattern-Brushes-Borders-TPL.zip"
Once you buy the set you will get an instant download link after the checkout page. you will also get an email with a link to download it later and after that you can always log into your account and download it from the downloads tab. 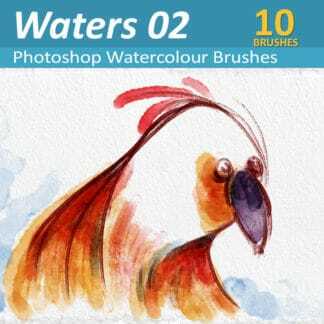 When there are new brushes added, just download it again! The Instant Way: Use your mouse! That is the fastest way to do it. When you draw with your mouse every shape will be the same size (set the slider at the top left, next to the brush tool) or use the square bracket keys [ and ] to decrease or increase the size of the shapes. With A Stylus: If you still want to use your stylus but not have the size react to pressure there are a few more steps. 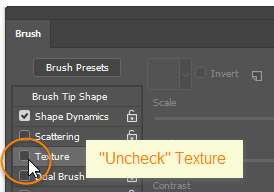 Open the Brush Panel and under "Shape Dynamics" change the "size jitter" control setting from "Pen Pressure" to "Off" Now adjust the size of the brush using the usual control and all your shapes will be the same size. 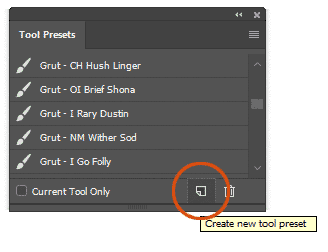 Note: If there are multiple shapes in one click of the brush (like in the Bubbles brush for example) you will still get a cluster of shapes in various sizes but the cluster size will remain consistent. My stroke starts with one shape in the wrong direction, what can I do? Photoshop will point your strokes in the direction that you are drawing, it checks the direction your mouse or stylus is moving in. If you are not moving when you first click, it can't possibly know where you are going, so it will just place your first shape in a random direction and then point the rest in the direction you travel in after that. To avoid stray, false starts you will want to try moving your stylus or mouse in that direction before you click to start drawing (get a "running start") This can take a bit of practice. The other thing that helps in this regard is painting on a new layer. That way you can tweak and trim your stroke with the lasso or an eraser if you need to and even reposition it with the move tool without worrying about the artwork in the layers below. 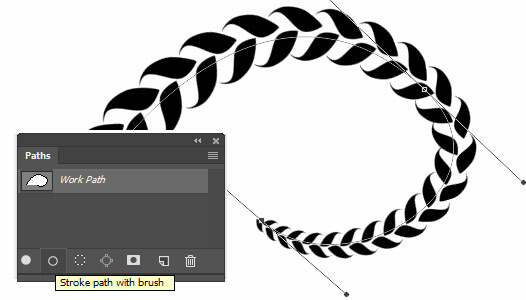 Keep in mind though that these brushes are not meant for precise technical illustrations (that's better done in Adobe Illustrator or Affinity Designer) They are meant to quickly paint, fun, decorative lines. I made these so we can all have fun, not to frustrate anyone, so if you can't get any fun out of them or find you can't get the results you want, just send me an email asking for a refund and I'll be happy to give you your money back! Even better, If you do have fun (I know you will!) and paint something neat, send it to me! I promise I will make some soon! They will be on this page. There is more general help, including tips and other tutorials on the help page here.